This page will tell the method to reallocate free space to C drive on Windows Server 2012 when system reports low disk space. Download IM-Magic Partition Resizer Server to reallocate disk space for Windows 2012 C drive without repartitioning the hard disk. Do you want to reallocate disk space when C drive is running on low disk space on Windows Server 2012? Do you need to repartition hard disk to reallocate disk space? Well, IM-Magic Partition Resizer Server works as partition magic to help reallocate disk without repartitioning hard disk or moving any data. This partition software enables you to shrink partition to squeeze unallocated space and extend partition by adding the unallocated space to it. You can completely rely on this software, which is safe and effective. You need to move the unallocated space close to C drive. And then, you can right click C drive and choose "Resize/Move". Add the unallocated space to C drive and click "Apply" button. "There is little free space on C drive on my PC which runs Windows Server 2012, but I cannot delete or move any data to free space. There is another partition which still has much free space, so I doubt if I can move some free space from another partition to C drive. I tried to open Disk Management to shrink the partition that has much free space and squeezed some unallocated space. But I cannot add the unallocated space to C drive because I cannot move the unallocated space close to the C drive. If I want to move the unallocated space close to C drive, I still need to delete the partition (D drive) between them, but I cannot do it. So is there any other way to extend C drive or move the unallocated space close to C drive?" 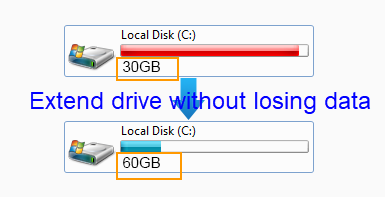 I want to reallocate disk space on Windows Server 2012 because C drive is lacking free space, but I don't want to repartition hard disk or reinstall system. Can you tell me the way to resize C drive on Windows 2012 without repartitioning disk? Truthfully, you can reallocate disk space without repartitioning disk, but you need to rely on third-party partition software. 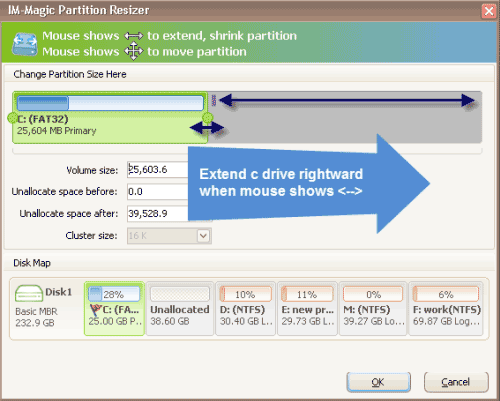 IM-Magic Partition Resizer Server helps resize hard disk so as to save you from repartitioning hard disk or moving any data. This partition software can extend C drive system partition and data partition By using this software, you have no need to move or delete any data, instead, this software can help move unallocated space from another partition to the partition that is lacking free space. This partition software supports NTFS and FAT32 C drive resizing without rebooting your computer. If you have installed virtual machine on Windows Server 2012 PC, can you resize hard disk when C drive is running out of disk space in VMware? The answer is yes! IM-Magic Partition Resizer Server can work in virtual environment to help with partition resizing without any influence on the virtual disk. This partition software can resize virtual disk and reallocate disk space as you wish. With help of this partition software, you can manage and redistribute the disk space in an easy way whenever you want. The software can work on Windows Server 2012, Windows Server 2012 R2 and other Windows Servers. Many people like to install programs on C drive, which often occupy lots of disk space. C drive usually works as system partition, so you may install system related program on this drive. However, you can install other programs to other partitions. In many situations, C drive doesn’t have a large capacity because people don’t allocate much space to it when dividing the hard disk. If you have lots of data to save, you had better buy a large hard disk and allocate much free space to C drive in order to prevent it from running out of disk space.